The goal for the night was to round/pillow all of the edges of the protruding box joints. 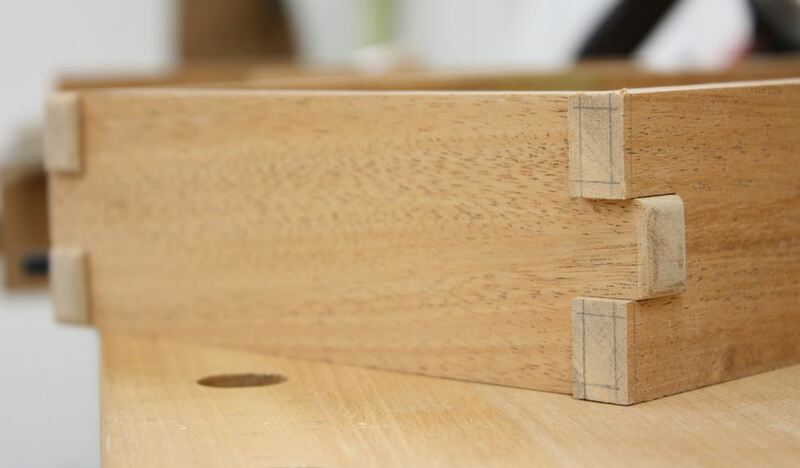 I didn’t want to round them past where the joint forms, so I used a pencil to indicate where I needed to stop on the long grain sides of each board. 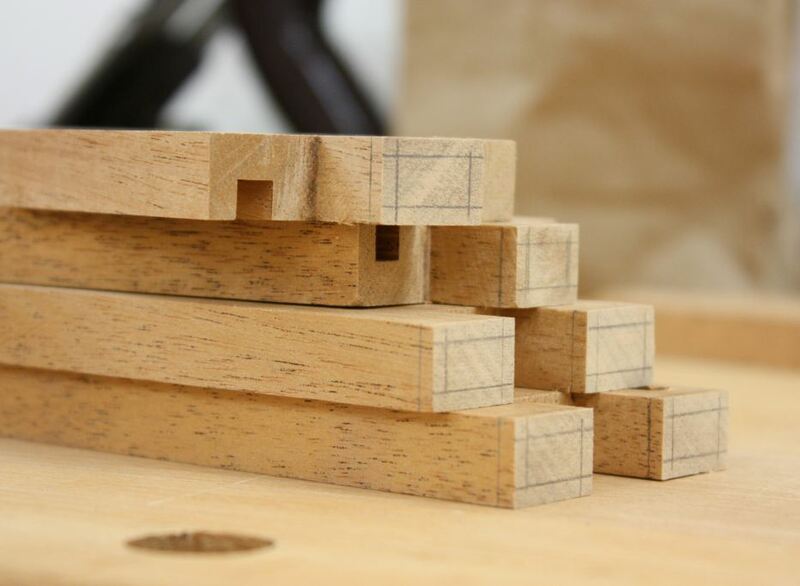 Then I wanted to make sure and round them all as consistently as possible, so I marked a distance off (as determined by my test pieces) on the end grain for all four sides of each protruding box joint. With my guidelines in place, I grabbed a fairly thin piece of scrap wood (ended up being about 3/8″ x 3/4″ x 6″), some 220 grit sticky-back sand paper (didn’t want anything too aggressive), and made a small sanding block to work the corners. I knew this would take a while. I also knew I could have started with a lower grit and worked faster, but I wanted to maintain control of the sanding and not go too far. You can always take more off, but it’s a fair bit harder to put it back on. I ended up playing through all three Mumford & Sons albums (the US release, a UK live version, and one called B-Sides/Unreleased) twice. At least I had good company while I worked! The end result wasn’t too bad. Pretty much what I was shooting for, too. I’ll come back and hit it with some 400 grit sand paper backed with fingertip pressure to smooth it out a bit more. Since the joint is a highlight of the piece, I’m not concerned with the end grain being darker than the face grain, but I do want it to have a nice clean appearance. But the real question is this: If I chose to repeat this style of box construction, how can I reduce my sanding time? I might be able to work some of the corners a little after the boards are cut to proper length but before I cut the joints in them. I’m not sure I want to try and use a plane of any kind on them after the joints have been cut because there are way too many speltching opportunities there. I DO have an old Rockwell sanding disk (it uses a pulley; it isn’t a direct-drive machine) I picked up on Craig’s list a few years ago and have yet to set up. Might be a good opportunity to get it put together and into use. Ethan, that’s a perfect place to use a razor sharp paring chisel. Just sand to remove the facets. Much faster than sanding it all. I believe the thought did cross my mind, Tom… not sure what happened to it after that, though. Since APPARENTLY people can’t play baseball in the rain when it’s 50 degrees out, I should be able to get into the shop again this evening. I’ll have to give it a try on some scrap (or maybe my poplar copy) and see how that works. Thanks for the gentle nudge! Alas, I didn’t make it down to the shop last night. But internet access is back. Oh, and I noticed I need to adjust my F-stop on my camera, so that’s done, as well. Sorry about the narrow depth of field on those last photos. Working on being as manual as I can with camera settings, but I don’t use it regularly enough to be completely competent with it. You could also try working with rasps or files to do the rounding. If you work from the long grain face and push over to the end grain, any chance of tearout should be minimized. @ Torch02 – Great suggestion! Especially around this time of year when I’m expected to come up with one or two items for the Christmas list!